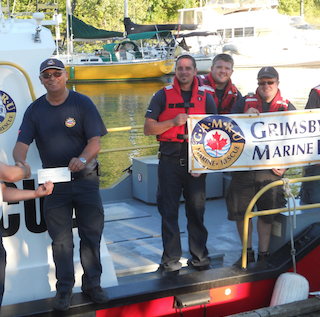 With at least a month still left in a busy boating season, the volunteers of GAMRU South Shore Search And Rescue have topped their own record for rescue missions in one year. A call on Monday afternoon pushed the group’s total number of rescue missions this year to 35. The previous record of 34 rescue calls in a season was set in 2016. The number and variety of rescue calls has unit leader Bob Gordon scratching his head. “You can’t point to one single factor behind the high number of calls,”said Gorden. As with other years, the rescues have included everything from vessels disabled by mechanical problems to lost and overdue vessels, to victims in the water and health emergencies, Gordon says. GAMRU ended the 2017 boating season with 28 rescue calls. Founded in 1988, GAMRU South Shore Search And Rescue responds to rescue calls in western Lake Ontario, serving the communities along the south shore from bases in Fifty Point and Grimsby with more than 30 active volunteers.